The weight of all he has seen and done, of the pain he has borne and the trials he has overcome bear down on his broad shoulders. The soldier's personal war is over: he is Heading Home. I did not choose to show the warrior's face in my painting of the homecoming veteran. The hero of Heading Home is not an individual at all; he is the essence of the American soldier. We cannot tell whether he returns from Normandy, from Saigon, from Beirut. In a sense, he has spilled his blood on all those fields of honor. 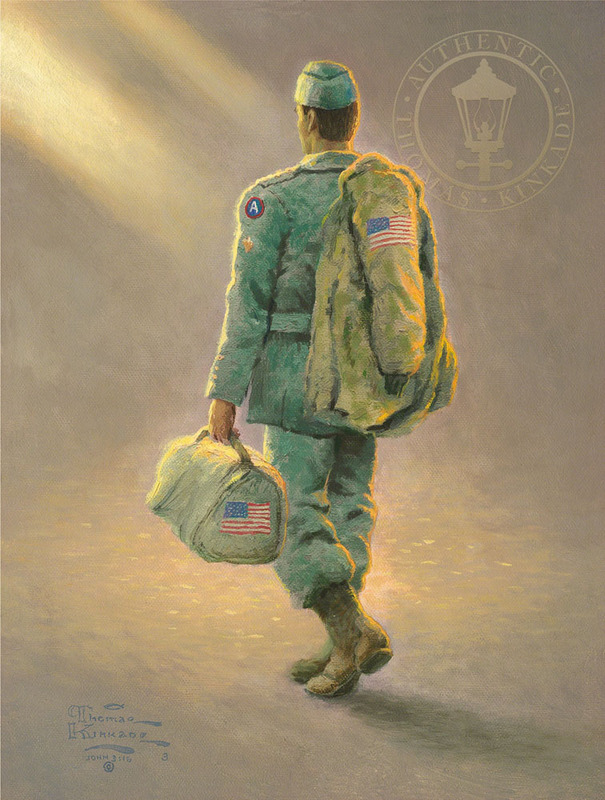 Like all of us, the soldier walks the path of his life and finds himself under God's watchful eye, alone. He is bathed in a golden light that can only be called "heavenly." Like all God's children, his ultimate destination is a heavenly home, where he can know the sweet peace of divine love. We can only wish him a joyful homecoming, and say a sublime word of thanks to the hero's of every generation!